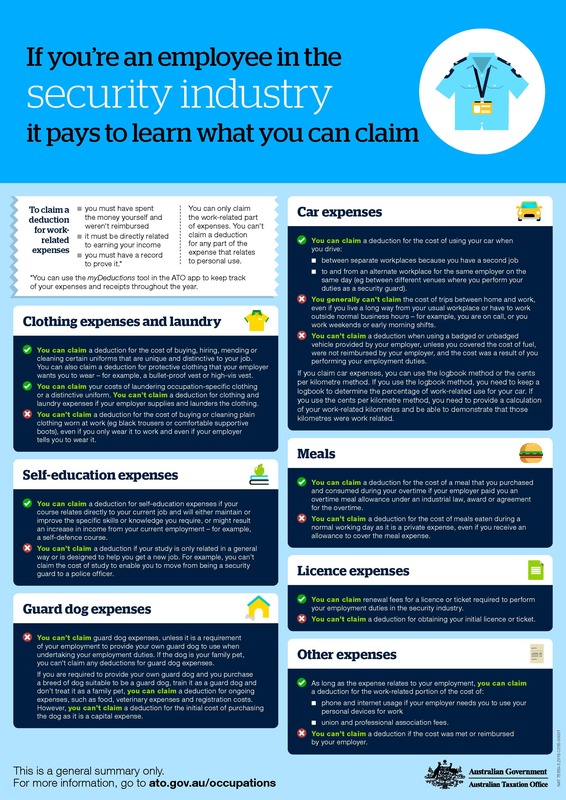 Designed to publish on your company website or display in staff rooms, this handy one-page poster outlines what security workers can and can’t claim at Tax Time. The following how-to guides describe what steps security workers need to take to correctly claim a range of common deductions. They are useful references to have on-hand not just during Tax Time but throughout the year, and help workers keep good records when making work-related purchases. The Migrant Workers’ Taskforce was established as part of the Government’s response to the revelation of significant wage underpayments in certain industry sectors. The Government has accepted in principle the establishment of a National Labour Hire Registration Scheme for the security industry which was named as one of the four high risk industry sectors. The report's recommendations include extending criminal penalties for serious breaches of the Fair Work Act.and accessorial liability rules currently in place for franchisors be extended to "also cover situations where businesses contract out services to persons". The National Labour Hire Registration Scheme would be an industry-specific, ‘light touch’ regulatory model to provide government with an important tool to better direct the enforcement of current laws by the existing regulators of labour hire operators. It would act as a form of negative licensing to prohibit labour hire businesses that contravene relevant laws from operating. Critically, it would complement other new and existing government measures that address the drivers of workplace exploitation. reduce exploitation of vulnerable workers by labour hire operators and in supply chains. However, the Government has varied the Fair Work Regulations 2009 to clarify that employers, in certain circumstances, may claim that an employee's casual loading payments should be offset against certain NES entitlements owing to the employee. This regulation comes into effect on 18 December 2018. How does the new regulation work? an employee is employed by their employer on a casual basis. the employee is paid a casual loading that is clearly identifiable as being an amount paid to compensate the person in lieu of entitlements that casual employees are not entitled to under the NES, such as personal or annual leave. despite being classified by the employer as a casual, the employee was in fact a full-time or part-time employee for some or all of their employment for the purposes of the NES. the employee has made a claim to be paid for one or more of the NES entitlements (that casual employees do not have) that they didn't receive for all or some of the time that they were incorrectly classified as a casual. If all of these points are satisfied, an employer can make a claim to have the casual loading payments made to the employee taken into account when working out the entitlements owing to the employee for the relevant NES entitlements. The new regulation applies to employment periods that occurred before, or that occurred on or after, 18 December 2018. Artibus Innovation is holding consultation workshops enabling interested parties, workers and training providers the opportunity to share feedback on the skills, knowledge and training needs required to undertake work or be re-skilled in the security industry. The feedback will provide valuable input into improving the quality of the qualifications and competencies required to meet the Vocational Education and Training (VET) needs of the industry. Please click one of the following links to register to attend a workshop (Sydney and Canberra registrants will be notified of the venues asap). Being a SPAAL member provides great benefits and we would now like to provide you with a value packed offer that is of benefit to all your staff. If you would like to provide this amazing opportunity to the people that matter most to your business, please forward this email. Instant quotes are provided with this special link below, this unique policy is only available to SPAAL members. Family members travelling with the employee are covered at no extra charge. 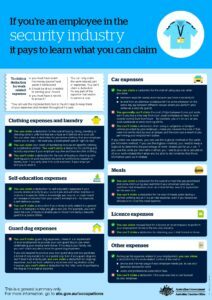 You can download more information on benefits and how to purchase with this handy guide. From 1 December 2018, modern awards will include new rules about requests for flexible work arrangements. Before responding to a request from an eligible employee, an employer must first discuss the request with the employee to try to reach an agreement about a change to their working arrangements. Requests can only be refused on reasonable business grounds. If employers refuse a request, they need to provide the employee with a written response. The building industry, cleaning and courier businesses are already required to provide taxable payments reporting to the ATO. The taxable payments reporting system requires businesses to report payments they make to contractors. Contractors can include subcontractors, consultants and independent contractors operating as sole traders (individuals), companies, partnerships or trusts. Businesses will need to start collecting information on payments to contractors from 1 July 2019.The first annual report is required by 28 August 2020. For reporting purposes, the ATO will include all security, investigation and surveillance services. Security - protection from, or measures taken against, injury, damage, espionage, theft, infiltration or sabotage. That includes anti-burglary, locksmith, body guards, security guards, armoured cars and any other services which can be provided to protect individuals or property. Investigation services - a searching inquiry in order to ascertain facts that is typically conducted by a detective or an enquiry agency and may be matters not necessarily related to security. It does not refer to any services which may be used to gather information such as online search engines. Surveillance services - a general watch or observation maintained over an area or location, by one or more persons or by using devices such as motion detector alarms, cameras or recorders. This includes night watch services, alarm monitoring and services that involve the use of closed-circuit television cameras for the purpose of surveillance or maintaining security". A business may not be required to complete a taxable payment annual report if the total payments received for security services for the financial year is less than 10% of the current or projected GST turnover or that you have not paid any contractor for security services.. The ATO website provides a range of information on Taxable payment annual report (TPAR) requirements. SPAAL will update members on the Taxable payment annual report (TPAR) requirements for security prior to the commencement on 1 July 2019. The Fair Work Commission has made a determination to vary the Security Services Industry Award 2010 to give effect to a decision inserting a “Casual Conversion Clause into the Award. The new provision comes into effect from 1 October 2018.